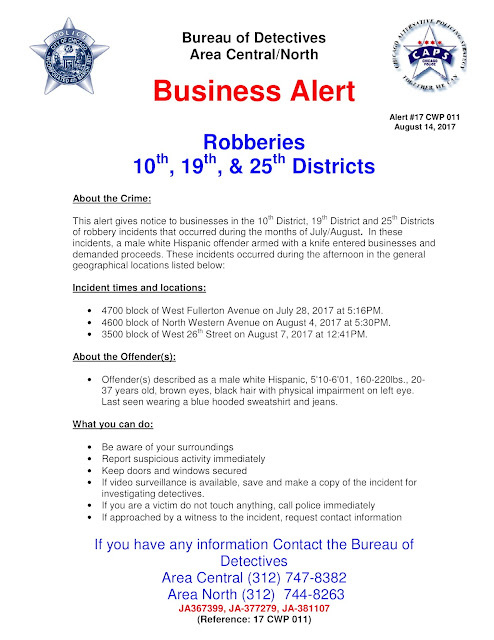 The recent armed robbery of a Lincoln Square jewelry store is part of a larger crime pattern, according to a new community alert from police detectives. At least two similar hold-ups have been reported at businesses since July 28, police said. In each case, a man armed with a knife has entered a business during the afternoon hours and demanded valuables. On August 4, the offender walked into the Nomadic Ant, 4604 North Western, around 5:20 p.m. and placed a knife to the side of an employee’s chest. After demanding “all of the money,” the man fled southbound on Western Avenue with cash, according to a report. Last Monday, the same man held up a store at 12:41 p.m. in the 3500 block of West 26th Street. Police said he also robbed a store in the 4700 block of West Fullerton around 5:15 p.m. on July 28. The suspect is a Hispanic man with a physical impairment to his left eye, according to the community alert. He stands 5’10” to 6’1” tall and weighs 160-220 pounds. He has black hair, brown eyes, and is between 20 and 37-years-old. The Lincoln Square victim said the man had bandages on his face. Anyone with information about these robberies is asked to call Area Central detectives at (312) 747-8382 or Area North detectives at (312) 744-8263.